Mrs. Marie Kemp Murray of Greensburg, Kentucky, daughter of the late Samuel Emmit Kemp and Are Helen Judd Kemp, was born on Friday, September 30, 1921 in Green County and departed this life on Wednesday, February 28, 2018 at the T.J. Samson Hospital in Glasgow. She was 96 years, 4 months and 29 days of age. She had made a profession of faith in Christ, was a member of the Greensburg Baptist Church and was a homemaker. Survived by her husband of 78 years, Thomas Murray of Greensburg, having united in marriage on December 23, 1939. Other survivors include a daughter and son-in-law: Carolyn M. and Thomas Jones of Louisville; two grandchildren: Steve Jones and his wife, Marcy of Nicholasville, and Karen Robinson and her husband Mark of Louisville; great-grandchildren: Cory Jones, and Shannon Gibson and her husband, Cory all of Nicholasville; a great-great-grandchild: Noah Gibson; nieces and nephews: Betty and Wally Jeffries, Wanda and Dennis Henry, Phyllis and Daryl Morning, Sara Murray, Margie Bloyd, David and Maggie Murray, Sam and Beverly Kemp, and Kenny Murray; special friends: Ray and Marian Acree, and Jimmy Little; and a host of other relatives and friends. Mrs. Murray was also preceded in death by two brothers and a sister: Cleveland Kemp, Atha Kemp, and Pauline Strader. 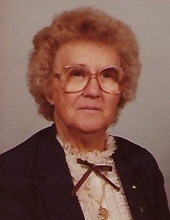 The funeral services for Mrs. Marie Kemp Murray will be conducted 10:00 A.M., Central Time, Saturday, March 3, 2018 at the Cowherd and Parrott Funeral Home with burial to follow in the Greensburg Cemetery. Bro. Blake Jessie, Bro. Todd Young, Ray Acree, and Rick Atwell officiating. Visitation is requested from 4 P.M. until 8 P.M., Friday at the Cowherd and Parrott Funeral Home and after 7 A.M., Saturday until time of the funeral service. Memorials are suggested to the Gideon Bible Fund, which can be made at the funeral home. To plant a tree in memory of Marie Kemp Murray, please visit our Tribute Store. "Email Address" would like to share the life celebration of Marie Kemp Murray. Click on the "link" to go to share a favorite memory or leave a condolence message for the family.